For centuries, people around the world have used used ginger for medicinal purposes. So did Confucius. He said he never ate a meal without it. Henry VIII recommended ginger to keep the plague away. English taverns in the nineteenth century used ginger in their beer. The Romans and Greeks used the herb in place of dramamine for long voyages at sea. Indians used it in Ayuverdic concotions. This incredible ‘hand’, or root of the Zingiber officinale, is an incredible food with numerous and wonderful healing qualities that have been experienced for at least the last 4400 years, if not longer. Ginger originates from Southeast Asia, but grows well in multiple climates. It now grows all over Europe, the US, China, Japan, Vietnam, Indonesia, and elsewhere. Full of antioxidants, iron, phosphorous, potassium, riboflavin, and more, ginger can kill salmonella as well as other undesirable viruses (including the common cold), and clots blood better than onion or garlic while reducing blood coagulation by inhibiting the cell synthesis of thromboxane. The spice can lower ‘bad’ cholesterol, can be used as a drug-free pain killer, helps with stomach ailments, and reduces nausea. It improves digestion by increasing salivary and stomach secretions. Japanese biochemists have also proven that ginger is one of many cancer-fighting foods, reducing cell mutation which can lead to cancer. 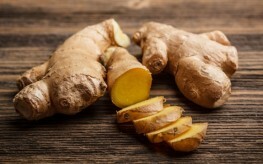 Another study coming to similar conclusions showed that ginger extract triggered apoptosis of G cells HCT 116 and HT 29 – cancer causing cellular lines. Check out this article for a more in-depth and complete list of the health benefits of ginger. Ginger can be used in cooking, taken as a supplement, or even consumed in teas or ginger candies. In India, children are given ginger to guard against whopping cough. Just a ¼ teaspoon of ginger per serving of cooked foods can deliver a great zing to vegetables or broths for soup and deliver all the powerful medicine that ginger offers to cure multiple ailments. You can grate the root into a pulp and use it fresh or find an organic extract to use in a pinch. Ginger never fails to deliver great taste and overall immune support and physical well-being.